Rahul's Blog and collections: On Saying 'NO"
Saying ‘No’ is perhaps the most difficult thing for most of us. We have been taught from our childhood that it is impolite to say ‘ no’ but no one ever tells us the merit of this magical word. As we grow, the expectations from elders at home, the friends at school and teachers and from everyone we come across keep increasing. Thus the pressure of performance with mounting expectations and learning never to say ‘No’ makes us beasts of burden. Once in the college the situation is no different except that with lesser controls the world around us becomes more care free! One also learns to evade, things not to liking, be it lectures at college , sermons at home, or an irritated friend. We bunk classes of teachers who are boring, shut off mentally when elders are on a mission to make us better human beings. When one starts working, no one likes to hear a ‘No’ as it is construed as the lack of interest or not enough capacity to handle work. When, I served in the Navy, any ‘No’ meant an act of indiscipline with immediate consequences. I remember the ones who sulked or tried to show defiance at the academy were awarded punishments like extra drills, excuse of liberty( meaning no outing in the town on the weekend), and more innovative ways of harassment. At later stages, any ‘No’ meant a shorter stint at the station with a threat of transfer looming large. Having been lucky to work in the corporate world , the life took a complete U- turn. In most of the meetings the more defiant one was, the lesser burden would be borne, and the meek ones found most of the action points recorded against their names in the ‘Minutes of the Meeting’. A dialogue where the participants were on the collision course always produced the best solutions. Also, the advantage of saying a short ‘No’ to the boss who was keen to load your straining back, led to another guinea pig would be found. This however, is the best course of action after realistically assessing the situation, as overkill could be detrimental in long run. When saying a ‘No’ can bring happiness, a better work life balance and keeping stress at bay, it is perhaps the best thing. Sometimes saying ‘No’ for the sake of purse is very helpful, especially when someone is asking for money. It is equally true when someone wants a slice of your time when your back is against the wall, a simple ‘No’ can save a lot of agony. The list could be endless, when a ‘No Thank You’, ‘Not Now, ‘Not this way’, ‘Not Again’ are some phrases that come in very handy. I am not good at saying 'no' to anybody! I was always after getting a 'good girl name' and even now I am. Let me see if I can change a bit at least after reading your lovely post. I don’t think there would be anyone without say no to someone... obviously money is a matter where the relationships are affected the most. When I feel something put me at stress, I am sure quit – no. Agree Jeevan! 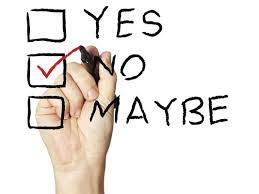 Saying No in financial matters is helpful when needed! Yes, one has to learn to say No for the sake of sanity and peace. When we please all we please none. But a lot depends on the situation. As you say, a No in armed forces is unthinkable. Exactly Alka, it is just not possible to please everyone! Also, in armed forces discipline is more important than anything else. Saying no gracefully is an art! Every time I have said yes when my heart said no, I have lived to regret it. Precisely, that is what happens to most of us! :) Thanks for reading Kokila! Very nice post. It truly is a task to say no. I loved the way you concluded this blog.